Editor's note: Professor Susan Knight visited with recent graduates Brandon James and Michelle Floyd during Homecoming week. She asked how their time at the UA School of Journalism influenced each. 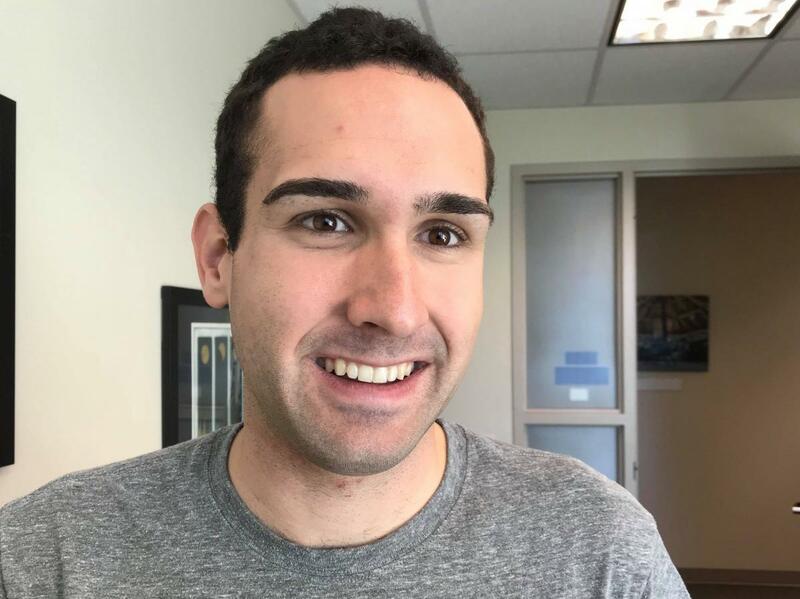 Much of what Brandon James learned in journalism school is coming in handy on his job on the digital team for Hendrick Motorsports, a Charlotte-based company with four NASCAR racing teams. As a content communications specialist for Hendrick, the 2016 graduate regularly writes race recap stories and posts for the company’s social media accounts. James was in town for Homecoming this week and stopped by the Marshall building to visit professors Susan Knight, Nancy Sharkey, William Schmidt and others. Hendrick was looking for journalism grads, not for writers with any knowledge of NASCAR, James said. In fact, they preferred a candidate, like him, someone who had no racing interest or background, someone who hadn’t already made assumptions about the industry — and someone with solid journalism skills. Deadlines: “I am writing fast on deadlines all the time. If not 5 to 10 minutes after a race, my editor is asking, ‘Where is it? Where is it?’” James said he appreciates the deadline-writing experiences in his J-school classes. The basics: “Online writing is somewhat different, but with any writing, it’s back to the basics and how do you write a good lead.” James said he got a foundation in solid writing in his journalism classes. Interpersonal communication: “I learned how to talk to people, how to interview,” he said. Attention to detail: His professors hammered a reporter’s need to get details, specifics. “That’s helped me a lot,” he said. An area work that James focuses on and where he think journalism students should spend more time learning is in content management systems and social media metrics and analytics, areas the faculty committee on undergraduate education in the J-school is studying currently for integration into required courses. Now living in Milan, Italy, 2017 graduate Michelle Floyd pitches in the Italian professional softball league for the team Caronno/Rhea. She recently received dual citizenship in Venezuela, so that she can play for the country’s national team, with an aim toward the Olympics. She helped Venezuela win the South American softball championships. This past summer, Floyd played softball in the Central American and Caribbean Games in Baranquilla, Colombia, and in the World Championships in Chiba, Japan, where she finished in the top seven pitchers for strikeouts worldwide. Floyd was in Tucson for a friend’s wedding during Homecoming week and stopped by to visit Undergraduate Adviser Paloma Boykin and professors Susan Knight, Nancy Sharkey and Kim Newton. Floyd handles social media and web duties for the Fellowship of Christian Athletes. She blogs about her travels and posts videos and career updates at MichelleMFloyd.com. She is also working on an online master’s degree in business and media focused on strategic branding from the University of Illinois. While in school, Floyd also worked for Arizona Athletics Creative Services team and as an intern for the College of Social and Behavioral Sciences Tech team. In March 2017, she threw just the ninth perfect game in UA softball history in an 18-0 win over Hartford. 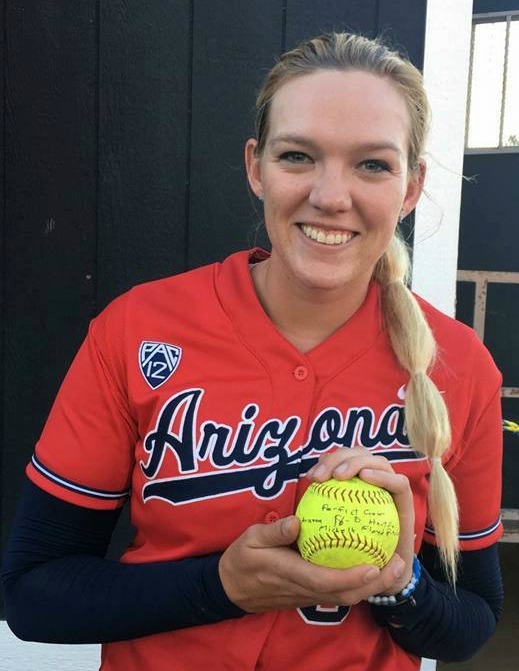 Another J-school alumna, Kenzie Fowler ('13), also pitched a perfect game for the Wildcats in 2010.